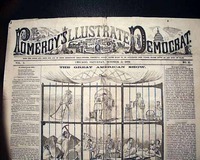 POMEROY'S ILLUSTRATED DEMOCRAT, Chicago, Oct. 5, 1878 Not only does this have a very decorative masthead (see the print of a $2 bill), but the front page has a large illustration of: "The Great American Show". Eight pages, various tears at margins & folds with a few small pieces missing. 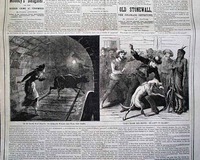 STREET AND SMITH'S NEW YORK WEEKLY, New York, NY, May 23, 1881. Subtitled: "A journal of useful knowledge, romance, amusement, etc." 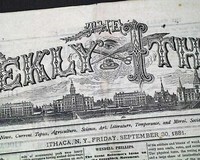 This issue has an intriguing and ornate masthead, which I suspect shows the campus of Cornell University. A title we have never seen before. This 8 pages newspaper has news of the with several interesting advertisements. 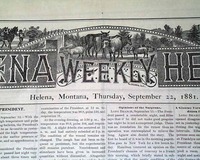 Decorative masthead. 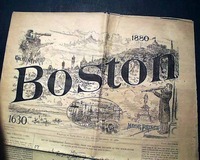 Complete in 8 pages, uncut, a little fold wear, otherwise nice. 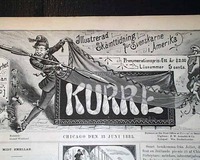 A rather rare Swedish-language newspaper from Illinois, the subtitle above the masthead translating to: "Illustrated Newspaper For Swedish America". 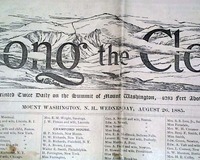 A very decorative masthead (see photos), 8 pages, nice condition. 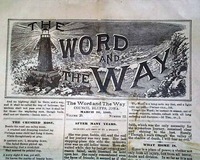 THE WORD AND THE WAY, council Bluffs, Iowa, March 10, 1905. 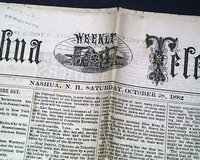 A small-size religious newspaper with a very decorative masthead featuring a lighthouse by the seashore (see photos). 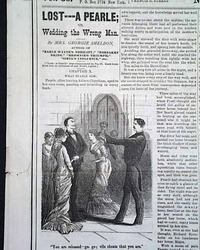 Tis title was published semi-monthly as a "...religious, family newspaper...". Never bound nor trimmed, a bit of light dirtiness to the front page, mostly nice. Measures about 9 by 12 inches.